ZIKAR-1A, from the russian space defence program, to detect fired rockets aiming at the (then) USSR from about 45.000 km away, mounted at some camera system from a satellite in orbit around earth. It is a catadioptric system with two Beryllium mirrors, f1.2/100mm and some fluorite aux. lenses. Several such systems were successfully launched into space and were in operation several years long. how large / heavy is it? Just curious, where did you find it?? Yea, this might be a lens from some auxiliary opto unit, not the main one. The early warning satellites use *huge* telescopes (70's Око ~300kg) which are operated in IR - to detect starting inter-continental missile's exhaust heat. Do you know why they used beryllium instead of aluminum ? Wow, amazing Klaus, another piece of space exploration history. So, the main question, how does it perform for UV imaging ? Interesting, thanks for explaining Klaus. At first I was confused by your James Webb reference as I knew that mirror is gold. So I went to the NASA site for clarification. The mirror "chassis" as it were is beryllium which is then plated with gold, instead of aluminum, as they are after IR wavelengths. The beryllium component is not the actual mirror, but the blank, which on earth would be glass. The coating is likely aluminum. Any better answers are certainly welcome to contradict me as I am certainly no expert in space based astronomy. Well, had you read the link I provided with that embedded pdf in it, I would not have to contradict: the three James Webb telescope mirrors are made of Beryllium with an overcoating of gold to enhance the IR reflectivity. But the mirror IS Beryllium, precicison grinded and polished. The gold is just there to enhance, a coating. Light can pass through a gold foil though, it just has to be thin enough. Pure gold is a very malleable substance and can be beaten with a hammer into foils of around 100 nm thickness. Sources suggest the gold foil used in the Geiger–Marsden experiment (known more commonly as the Rutherford gold foil experiment) was about 86 nm thick. Somewhere around this region of thickness, gold starts letting light through, as well as alpha particles. It is well known that ~20 nm thick gold (or any other metal) deposited onto a surface by thermal evaporation in a vacuum is essentially invisible and can be used as a transparent conducting surface/electrode. As the foil gets thicker, the gold starts to absorb a noticeable amount of photons, especially in the violet/blue part of the electromagnetic spectrum, while scattering away the red light. The light scattered off a semi-transparent gold film acquires a reddish/yellow tinge, while the light that still does make it through is blueish. When the film reaches 100 nm or so, it becomes practically as opaque as the bulk metal. In truth, comparing the mean free path or collision cross-sections of photons and alpha particles through a gold sheet is somewhat more complicated than just saying alpha particles should penetrate less because they're massive, so it would be conceivable for a film of appropriate thickness to block photons yet still allow alpha particles through. A very coarse, hand-waving explanation is that photons are absorbed in the electrosphere of a gold atom, while an alpha particle is only significantly pushed away if it bangs almost straight into the nucleus, a region composing approximately 10−15 of the volume of the atom. And the NASA site has the gold vapor deposition at: 100nm. Yea, your lens was a part of TB (телевизионная аппаратура) unit. 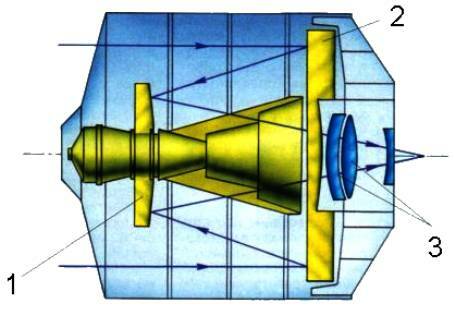 The main TП (теплопеленгатор) unit is described at the bottom - it's the massive lens (mirror diameter of up to 100cm) I had described. 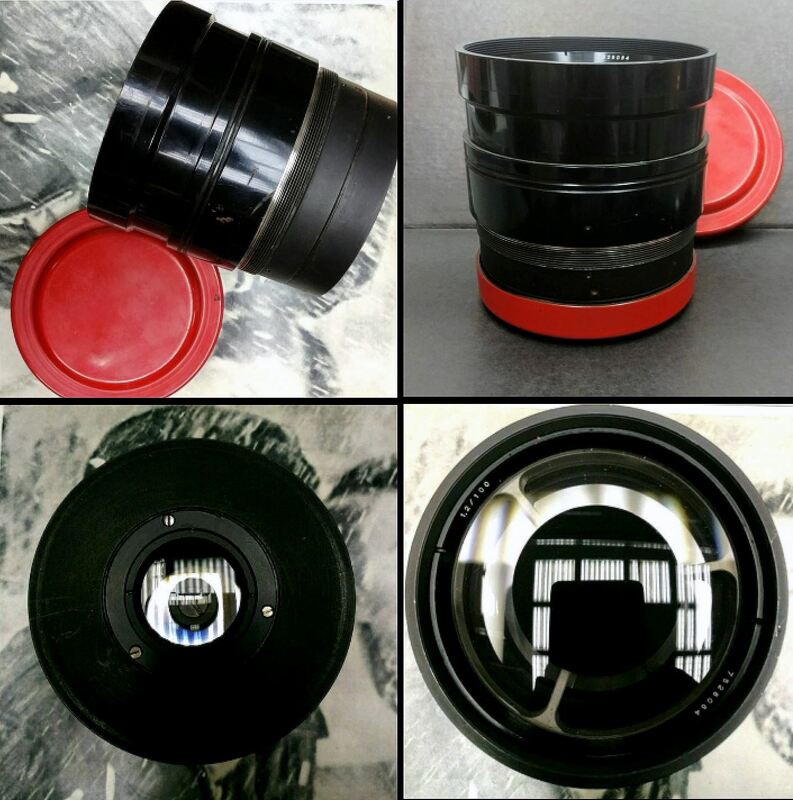 Early versions УС-К diameter of 50cm. Later version УС-КМО 100cm. the surface form is a convex hyperbola of the second order. 2 - a mirror made of vitrified beryllium with a diameter of 100 cm, a surface shape of an aspheric of the 12th order. 3 - lenses made of fluorides of calcium and lithium. Thank you, as I have already stated in the quoted and translated russian text, it is / was for the Television unit (телевизионная аппаратура) which also worked in infrared. Gold works better than most other metals for IR. Beryllium has a good very-low temperature properties. Measured the lens' transmission and the big surprise it, that it has a flat transmission and also works down to 320nm in UV!